Objective: The objective of this study is to evaluate the postoperative analgesic effect of a combination of ropivacaine and dexmedetomidine for ultrasound-guided fascia iliaca compartment block (FICB) after knee arthroscopy. Materials and Methods: Forty patients scheduled for knee arthroscopy were randomized to receive either 30 ml of 0.25% ropivacaine alone (Group A, n = 20) or combined with dexmedetomidine 1 μg/kg (Group B, n = 20). Pain intensity was evaluated using the visual analogue scale (VAS), at rest and during activity at 4, 6, 8, 12, and 24 h after surgery. Level of consciousness was evaluated using the Ramsay sedation score. Time to first analgesic request after surgery, the dose of analgesic used in the first 24 h after surgery, variation of heart rate, and adverse reactions were also recorded. Results: VAS scores at 6 and 12 h after surgery were significantly lower in Group B compared to Group A (P < 0.05). No significant difference was observed in the Ramsay sedation score or time to first analgesic request after surgery (P > 0.05). The total dose of analgesic used in the first 24 h after surgery was higher in Group A than in Group B. The incidence of bradycardia was higher in Group B compared to Group A. No adverse reactions were observed in either group. Conclusion: FICB with a combination of ropivacaine and dexmedetomidine resulted in significant reduction of VAS scores with lower postoperative analgesic requirement after arthroscopic knee surgery. No adverse reactions or complications were noted except for lower heart rate in Group B patients. Ying Li, Jun Geng: These authors contributed to the work equally and should be regarded as co.first authors. Ultrasound-guided fascia iliaca compartment block (FICB), widely used in lower extremity surgery, provides effective postoperative analgesia with relatively few side effects., Ropivacaine is a commonly used local anesthetic agent for peripheral nerve blocks with few adverse effects. However, single bolus of ropicacaine does not last long, so a continuous infusion is usually necessary for a longer duration of postoperative analgesia, leading to an increase in medical and nursing expenses. There has been increasing interest in prolonging the analgesic effect of local anesthetic agents. Dexmedetomidine, an α2 adrenergic receptor agonist, exerts its analgesic and sedative effects through its α2 receptor affinity. Some reports, suggest that dexmedetomidine can increase the efficacy and prolong the duration of sensory and motor blockade of ropivacaine in a dose-dependent manner. This study aimed to investigate the analgesic effect of dexmedetomidine added to ropivacaine in unilateral FICB for knee arthroscopy. We enrolled 40 patients, including 19 men and 21 women, aged between 26 and 80 years, who were scheduled for knee arthroscopy under spinal anesthesia. Sample size was calculated based on our pretest data; 12 patients were required in each arm of the study to provide us with an α of 0.05 and a statistical power of 0.9. Patients were in American Society of Anesthesiologists (ASA) physical status class I or II and were allocated randomly to receive ropivacaine alone (Group A) or ropivacaine combined with dexmedetomidine (Group B) [Figure 1]. We excluded patients with severe cardiac, pulmonary, renal, or hepatic dysfunction; cognitive impairment; psychological or mental disorders; coagulopathy; and allergy to opioids or local anesthetics. All experimental procedures were approved by the Medical Ethics Committee of The Affiliated Jiangyin Hospital of Southeast University Medical College and in accordance with the Helsinki Declaration. Written informed consent was signed by all patients and family before surgery. The present study is a prospective, randomized, double-blinded, controlled trial. In the operating room, patients were monitored continuously with electrocardiogram (ECG), oxyhemoglobin saturation, and noninvasive blood pressure; venous access was secured. We performed FICB combined with spinal anesthesia in all patients. All study solutions were prepared by one nurse. To make 30 ml of 0.25% ropivacaine for Group A, ropivacaine 75 mg/10 ml (Naropin®; AstraZeneca AB, Sodertalje, Sweden) was diluted with 20 ml of 0.9% saline (Baxter Healthcare). For Group B, we diluted dexmedetomidine 200 μg/2 ml (Precedex, Hengrui. Lianyungang, China) with 48 ml of 0.9% saline to obtain a volume of 50 ml. The volume of diluted dexmedetomidine administered to the patient was calculated based on patient weight; for example, for a 50-kg patient, 12.5 ml of dexmedetomidine solution was combined with 10 ml of Naropin and 7.5 ml of 0.9% saline. In this way, we made 30 ml of 0.25% ropicacaine combined with 1 μg/kg dexmedetomidine for Group B. After positioning the patient, a line was drawn between the anterior superior iliac spine and the pubic tubercle (along the inguinal ligament), followed by routine disinfection and draping. A high-frequency ultrasound transducer (10–13 MHz, SonoSite S-Nerve, Bothell, WA, USA) was placed parallel to the inguinal ligament. The femoral artery was identified at the intersection of inguinal ligament and the skin crease at the proximal end of the thigh. The fascia iliaca and iliopsoas muscle were identified lateral to the femoral artery. A 20-ga venous cannula was inserted in plane with the transducer at the lateral end of the thigh. After negative aspiration, 2–5 ml of 0.9% saline (Baxter Healthcare) was injected to confirm the appropriate plane of injection between the fascia and the iliopsoas muscle. This was followed by injection of 30 ml of the local anesthetic solution (0.25% ropivacaine or 0.25% ropivacaine combined with 1 μg/kg dexmedetomidine) after the saline was seen to spread along the fascia iliaca. The block was considered to be effective if sensation decreased along the anterior, medial, and lateral thigh 20 min later and we may not include the patient if his/her FICB was failed. After successful FICB, a spinal anesthesia was performed with 1.5–2.0 ml of 0.5% ropivacaine, for an anesthetic level of T10 or lower. Ephedrine 10 mg or urapidil 15 mg was administered to maintain mean arterial pressure within 20% of baseline. When heart rate was less than 50 bpm or more than 120 bpm, 0.5 mg atropine or 10–30 mg of esmolol, respectively, was injected. We did not administer continuous analgesia; if the VAS score was 5 or more, 75 mg of diclofenac sodium was administered intramuscularly. We noted the VAS scores at 4, 6, 8, 12, and 24 h after the FICB; the Ramsay sedation scores were also recorded. Heart rates at various time points, the postoperative dose of analgesics, and any adverse drug reactions such as hypotension, hypertension respiratory depression, nausea, vomiting, and urinary retention were also recorded. Statistical analysis was performed using SPSS statistical software, version 18.0. Quantitative data are presented as mean ± standard deviation. Means within or between groups were compared using the t-test and analysis of variance, respectively. Enumeration data were analyzed using the χ2 test. Values of P < 0.05 were considered statistically significant. Both groups were comparable in terms of gender, age, height, weight, ASA class, and duration of surgery (P > 0.05) [Table 1]. There was no significant difference in Ramsay scores between groups at various time points (P > 0.05) [Table 2]. 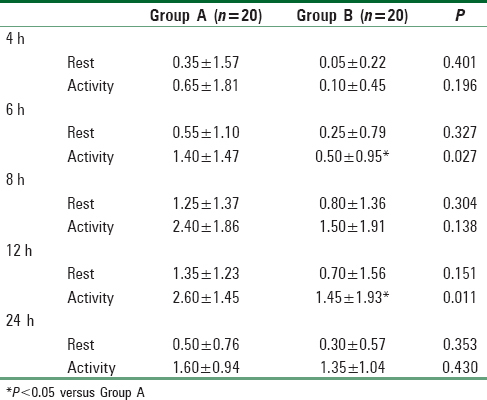 There was no significant difference between the two groups of VAS score during rest [Figure 2], whereas VAS scores during activity at 6 and 12 h after surgery were significantly lower in Group B patients compared with those in Group A (P < 0.05) [Table 3] and [Figure 3]. Nine patients in Group A and three in Group B received additional analgesics according to demand in the first 24 h after surgery. There was no significant difference in the time to the first dose of analgesic after surgery. However, patients in Group A required a higher dose of supplemental analgesics in the postoperative period [Table 4]. Heart rate at 8 h after surgery in Group B patients was significantly lower than in Group A (P < 0.05); there was no difference at other time points (P > 0.05) [Table 5]. Adverse drug reactions such as hypotension, hypertension, respiratory depression, nausea, vomiting, and urinary retention were not observed during the study. There are few reports on ultrasound-guided FICB for arthroscopic surgery of the knee. We carried out this study to evaluate the effect of a combination of ropivacaine and dexmedetomidine for ultrasound-guided FICB for knee arthroscopy. Knee arthroscopy is widely performed in clinical practice with advancement in endoscopic techniques. Postoperative complications such as adhesions or ankylosis of the knee joint can be reduced by early functional rehabilitation, which necessarily depends on providing adequate pain relief after surgery. Acute pain after arthroscopic knee surgery is mainly around the incision site, supplied by the femoral nerve and the lateral cutaneous nerve of the thigh. Previous reports suggest that the incidence of severe postoperative pain could be as high as 76% after arthroscopic knee surgery. Intra-articular injection of drugs can provide local analgesia to patients with minimal systemic adverse effect., However, the intra-articular pressure may increase after injection and can lead to systemic absorption after tourniquet release. Furthermore, intra-articular local anesthetics are of limited efficacy. FICB has been successfully used for postoperative analgesia after hip fracture surgery, femoral fracture, hip, and knee arthroplasty and can effectively block the femoral nerve, the lateral cutaneous nerve of the thigh, and the obturator nerve. Identification and localization of the fascia iliaca compartment is possible by ultrasonic visualization, thus increasing the rate of successful block while reducing complications such as vascular and nerve injury. In this study, we identified the fascia iliaca compartment using a high-frequency ultrasound probe parallel to the inguinal ligament. In most cases, the anisotropic, hypoechoic iliopsoas muscle was covered by the hyperechoic broad ligament and fascia iliaca. The in-plane needle technique makes it possible to observe needle insertion and diffusion of local anesthetics below the fascia iliaca in real time. Our study showed that VAS scores during activity in Group B patients were significantly lower than Group A at postoperative 6 and 12 h; the dose of supplemental diclofenac sodium was also less than in Group A. Moreover, only three patients (15%) in Group B required additional analgesics compared to nine patients (45%) in Group A. Therefore, a combination of ropivacaine and dexmedetomidine was more effective than ropivacaine alone for the quality of analgesia with ultrasound-guided FICB. Ropivacaine is long-acting amide local anesthetic. A single- dose block provides effective analgesia for a maximum duration of 9–14 h, whereas a continuous block by catheter insertion can provide a longer duration of analgesia. Dexmedetomidine, a potent alpha-2 agonist, can act on both presynaptic and postsynaptic nerve endings in the central nervous system through decreasing the norepinephrine release and sympathetic outflow, leading to analgesia, sedation, and anxiolysis. Ke Sun et al. showed that combining ropivacaine with dexmedetomidine in FICB could provide effective pain relief on activity in patients with proximal femoral fracture, without significant adverse reactions. In addition, a previous study suggested that this combination could antagonize the influx of cations, stimulate C fibers, and thus provide non-receptor-dependent analgesia. We also observed a consistent benefit with FICB using this combination in our study. Multiple studies, have shown that adding dexmedetomidine to ropivacaine could improve the effectiveness, hasten the onset of action, prolong the duration of block, and reduce postoperative analgesic requirements. 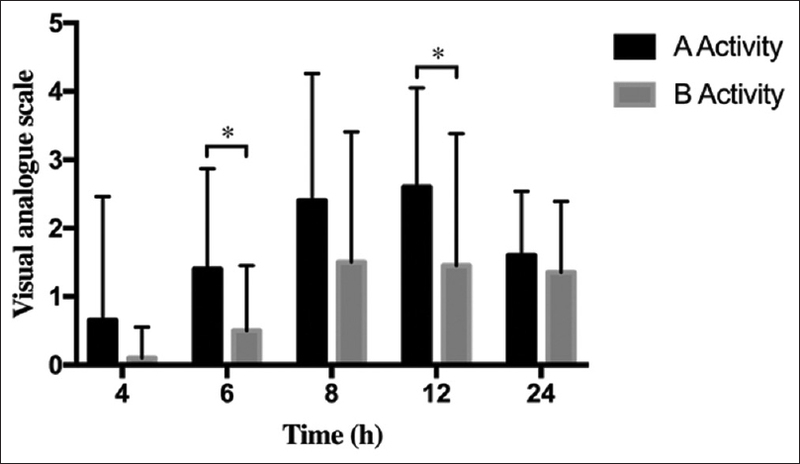 There was no significant difference in the time to first analgesia between the two groups in our study [Table 4]. However, the robustness of this result may be in question due to the small sample of our study, and a study with larger sample sizes should be conducted in the future to confirm this result. In addition, it is unclear whether the result of our study is due to systemic or peripheral effects because of the inevitable absorption of dexmedetomidine into the bloodstream; further studies are required to confirm the mechanism of action of combined dexmedetomidine and ropivacaine on pain relief. In our study, the heart rate of patients in the combination block group at 8 h after surgery was lower compared with the control group, although this was of no clinical significance and did not need active treatment. The lower heart rates may have been related to the intrinsic sympatholytic property of dexmedetomidine, which may cause hypotension and bradycardia. This may require closer monitoring in the postoperative period. There was no significant difference in Ramsay sedation scores between groups. No adverse effects were observed during our study, suggesting the reliability and safety of combining dexmedetomidine with ropivacaine in FICB. Our study is limited by a small sample size; larger multicentric studies are required to confirm our results. Besides, it would have been more valid and reliable if the duration of the block was checked in our study. At last, further research to identify the optimal dose of added dexmedetomidine is also warranted. In conclusion, a combination of dexmedetomidine and ropivacaine with ultrasound-guided FICB is effective in providing postoperative analgesia with few adverse reactions. A dose of 1 μg/kg dexmedetomidine with 0.25% ropivacaine can effectively relieve pain during activity after arthroscopic knee surgery. This technique may be appropriate for more widespread use. This work was supported by the grant from the Health Bureau of Wuxi (MS201531). Kumar D, Hooda S, Kiran S, Devi J. Analgesic efficacy of ultrasound guided FICB in patients with hip fracture. J Clin Diagn Res 2016;10:UC13-16. Bang S, Chung J, Jeong J, Bak H, Kim D. Efficacy of ultrasound-guided fascia iliaca compartment block after hip hemiarthroplasty: A prospective, randomized trial. Medicine (Baltimore) 2016;95:e5018. Wallace JB, Andrade JA, Christensen JP, Osborne LA, Pellegrini JE. Comparison of fascia iliaca compartment block and 3-in-1 block in adults undergoing knee arthroscopy and meniscal repair. AANA J 2012;80:S37-44. Rosseland LA, Helgesen KG, Breivik H, Stubhaug A. Moderate-to-severe pain after knee arthroseopy is relieved by intraartieular saline: A randomized controlled trial. Anesth Analg 2004;98:1546-51. Antoni M, Jenny JY, Noll E. Postoperative pain control by intra-articular local anesthesia versus femoral nerve block following total knee arthroplasty: Impact on discharge. Orthop Traumatol Surg Res 2014;100:313-6. Gupta B, Banerjee S, Prasad A, Farooque K, Sharma V, Trikha V. Analgesic efficacy of three different dosages of intra-articular morphine in arthroscopic knee surgeries: Randomised double-blind trial. Indian J Anaesth 2015;59:642-7. Whitford A, Healy M, Joshi GP, McCarroll SM, O'Brien TM. 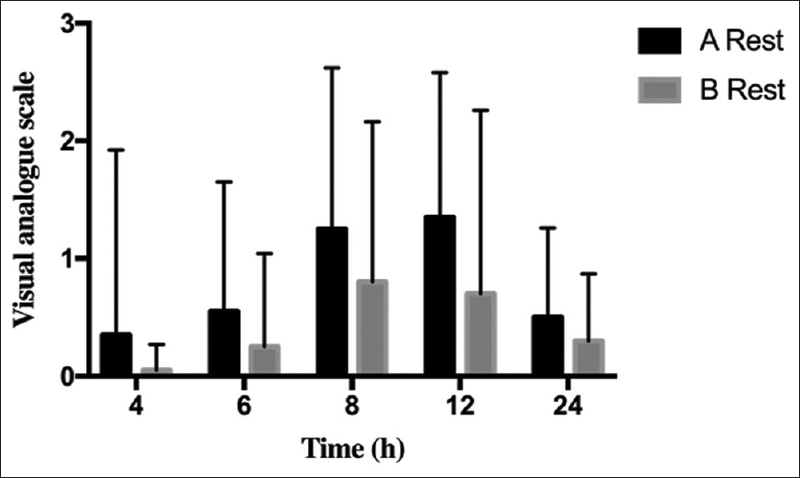 The effect of tourniquet release time on the analgesic efficacy of intraarticular morphine after arthroscopic knee surgery. Anesth Analg 1997;84:791-3. Diakomi M, Papaioannou M, Mela A, Kouskouni E, Makris A. Preoperative fascia iliaca compartment block for positioning patients with hip fractures for central nervous blockade: A randomized trial. Reg Anesth Pain Med 2014;39:394-8. Kiran S, Jinjil K, Tandon U. Evaluation of dexmedetomidine and fentanyl as additives to ropivacaine for epidural anesthesia and postoperative analgesia. J Anaesthesiol Clin Pharmacol 2018;34:41-5. Sun K, Jin M, Hu Y, Yi J, Yuan L, Wang G. Efficacy of fascia iliaca compartment block with dexmedetomidine combined with ropivacaine for analgesia in patients suffering from proximal femoral fractures. Chin J Anesthesiol 2014;34:1330-3. Andersen JH, Grevstad U, Siegel H, Dahl JB, Mathiesen O, Jæger P. Does dexmedetomidine have a perineural mechanism of action when used as an adjuvant to ropivacaine? : A paired, blinded, randomized trial in healthy volunteers. Anesthesiology 2017;126:66-73. Chinnappa J, Shivanna S, Pujari VS, Anandaswamy TC. 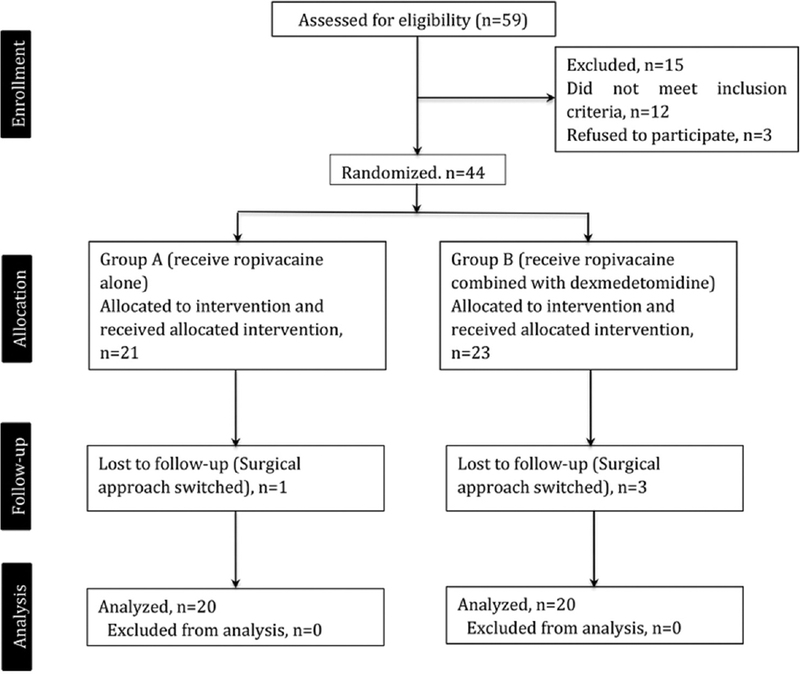 Efficacy of dexmedetomidine with ropivacaine in supraclavicular brachial plexus block for upper limb surgeries. J Anaesthesiol Clin Pharmacol 2017;33:81-5. Ding W, Li W, Zeng X, Li J, Jiang J, Guo C, et al. Effect of adding dexmedetomidine to ropivacaine on ultrasound-guided dual transversus abdominis plane block after gastrectomy. J Gastrointest Surg 2017;21:936-46. Grewal A. Dexmedetomidine: New avenues. J Anaesthesiol Clin Pharmacol 2011;27:297-302.